Happy Wednesday! It’s time for another What I Ate Wednesday post; I always enjoy putting these together and I hope you like reading them too. I’ve actually changed up my eating habits a little bit recently so I’m excited to share that with you. I’ve been trying out intermittent fasting. If you don’t know, intermittent fasting is when you fast for longer than usual in between dinner and breakfast; for some people this means they skip breakfast and have lunch as their first meal of the day. I haven’t gone that extreme yet though (and don’t think I ever will to be honest), but I have been making a concious effort to finish eating dinner early and eat breakfast later. Currently on a regular day I eat dinner at 6 and breakfast at 9, meaning that I fast for 15 hours. There are a lot of benefits that people report from doing intermittent fasting (I recommend reading this article for more information if you’re interested) but for me, it has helped me focus more in the mornings and to snack less. I’m really enjoying it for now. I’m also not too strict with myself; if I’m still really hungry later on in the evening I’ll eat (always listen to your body!) and I would never pass on late dinner plans with friends. But it’s a new healthy habit that I’m enjoying at the moment. Now let’s get into what I ate on a typical day last week, before I bore you. Is there any better way to break the fast than with pancakes? I don’t think so! 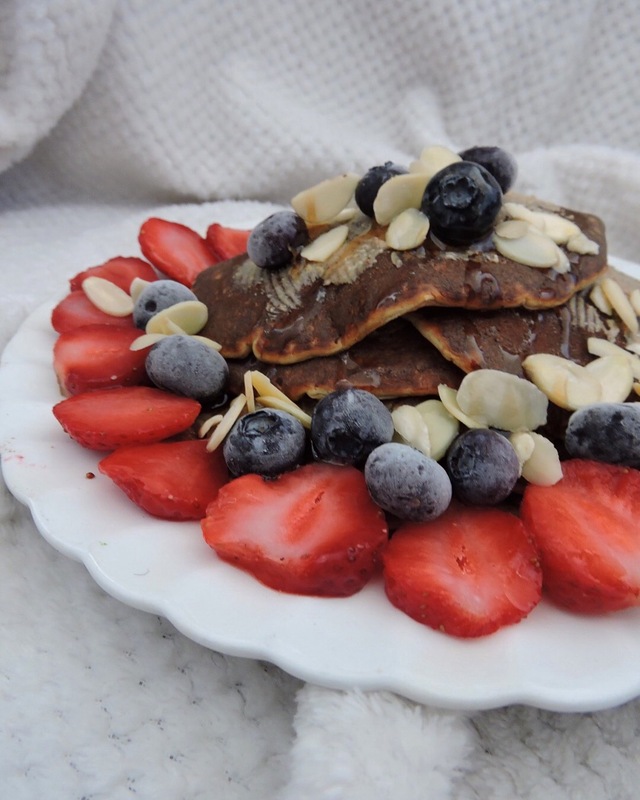 I’ve been having pancakes quite often recently; I make a healthy batter (recipe coming soon!) and always top it with fruit and peanut butter. Perfect breakfast to get you through the morning. I’ll usually have my morning coffee at the same time, and this will fill me up till lunch. Another new obsession of mine is sandwiches, especially this bad boy. 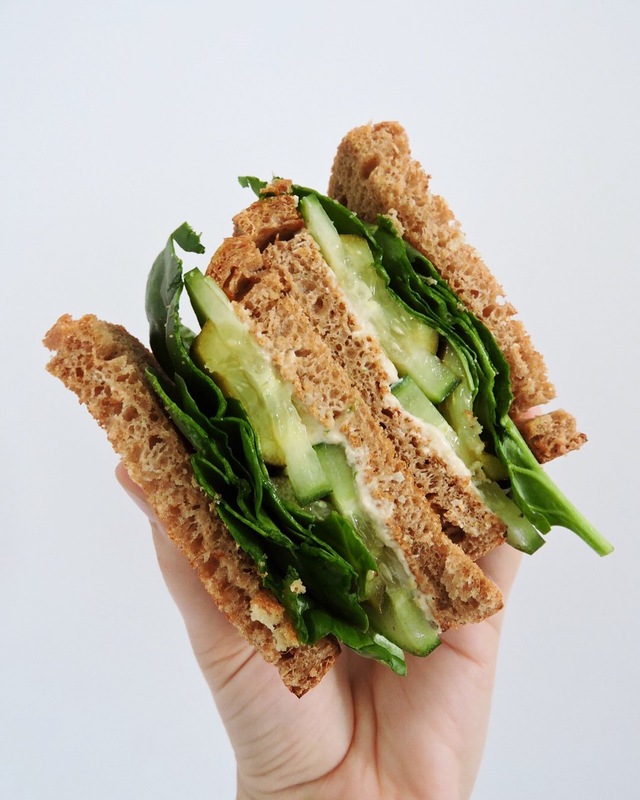 This is toasted Polish brown rye bread with hummus, cucumber, pickles and spinach. That might sound bland but it’s so tasty and full of health. I have two of these for lunch and they’re the perfect lunch meal. Like I said at the start of this post, intermittent fasting has helped me with snacking less, but that doesn’t mean I don’t snack at all any more. I definitely still have snack cravings, particularly in the afternoon, and these are my current go-to. I posted a review of these last week, and I’m really obsessed. 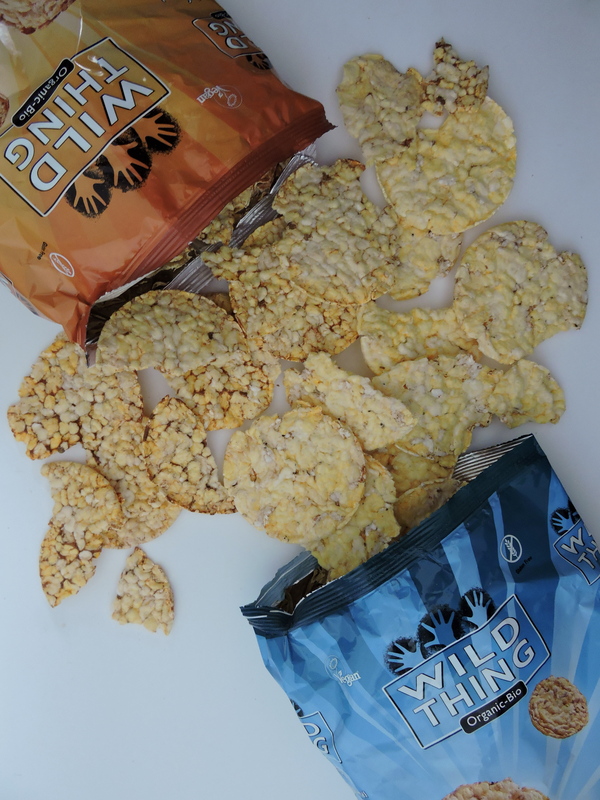 They’re really healthy but it feels like you’re eating crisps; perfect situation if you ask me! I’ve really been liking simple dinners lately. 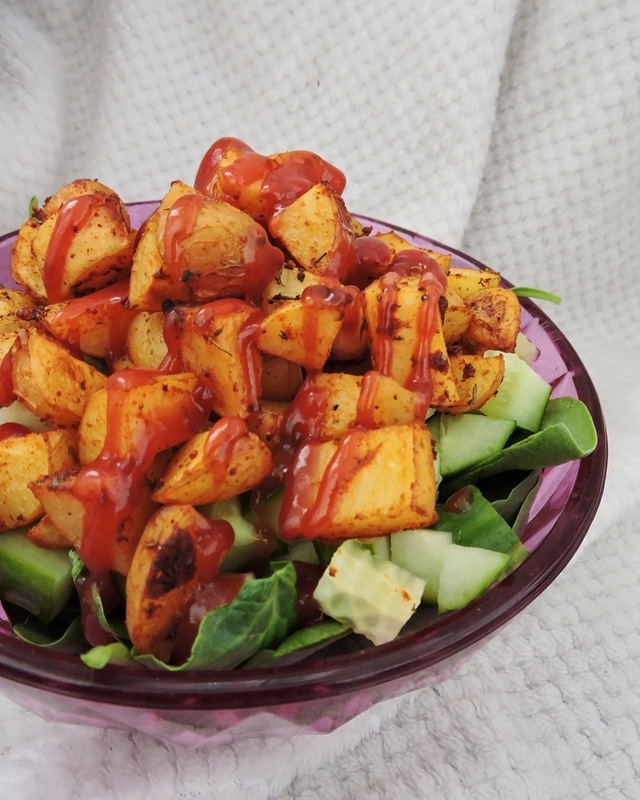 This is just a bed of spinach with cucumber, roasted potatoes and ketchup. A big bowl of this fills me up and is really enjoyable; sometimes the simplest foods are the tastiest. I’ve also been trying to incorporate more greens into my diet and meals like this really help with that. Do you have any new food obsessions? Let me know in the comments! Omg everything looks super delicious!